London: Stackhouse, c.1786. With bright original colour. Nuremberg, c.1706. 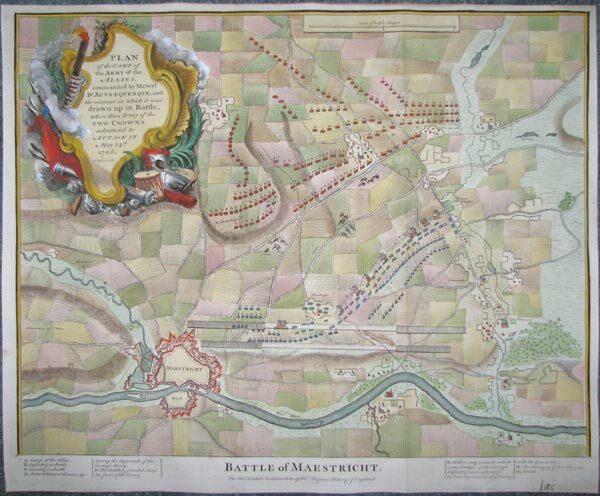 A large and decorative map of Belgium during the War of the Spanish Succession. The progress of the English army under John Churchill, Duke of Marlborough, through the low countries is marked by a series of towns marked in red as 'Englische Besatzung' ('occupied by the English'). 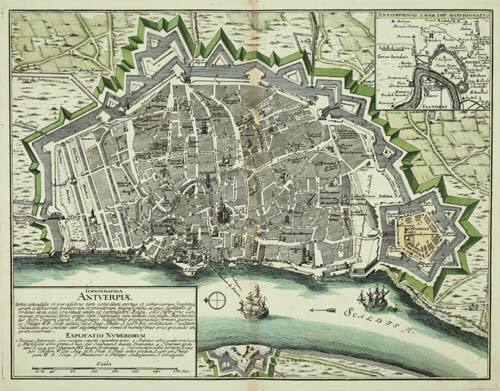 Antwerp has yet to fall, dating the map to pre-1706. A vignette lower right has a prospect of Luttich / Leige. London, c.1745. Published for 'Mr Tyndal's Continuation of Mr Rapin's History' [of England], with a decorative title cartouche. London Printing and Publishing Company, c.1860. 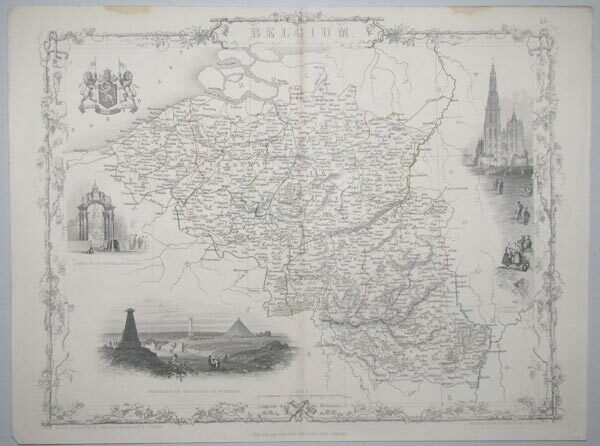 With inset vignettes including views of Antwerp Cathedral and the Monuments on the Plains of Waterloo. Frankfurt, c1660. The Hansiatic League Headquarters in Antwerp. Paris, 1705. Plan of Antwerp, focusing on the defences, with an extensive key. With a sheet of engraved text. 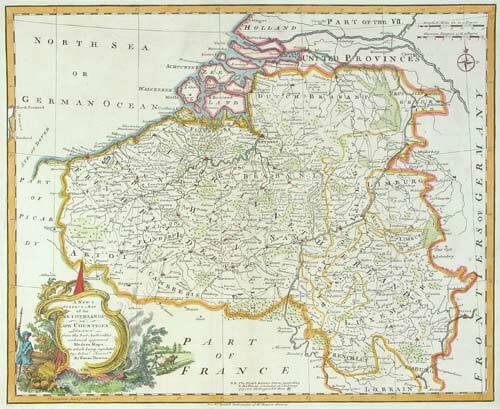 Brussels, 1711-12. A fine impression of this plan of Antwerp, highlighting the fortifications and showing the important buildings in profile. An inset shows the environs of the city. 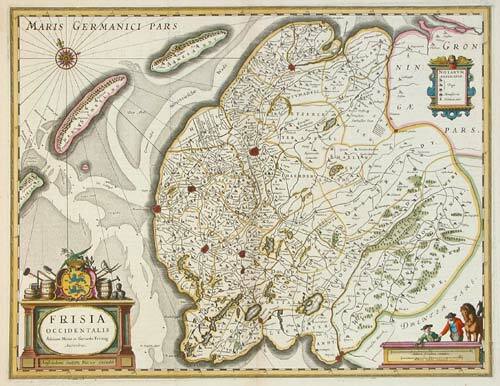 Nuremburg, 1718. Detailed townplan, with an inset of the environs. Cologne, c.1572. Bird's-eye view of Bruges from the northwest, published in the 'Civitates Orbis Terrarum'. London: Baldwin & Cradock, 1837. 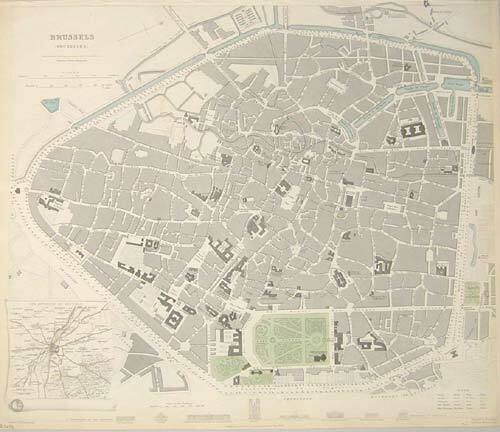 Detailed map of Bruxelles, with an inset map of the environs. London, 1745. Fought in the War of the Spanish Succession. 'D'Auverquerque' is the Dutch General Ouwerkerk, ally of Marlborough against the French. Engraved by Basire for 'Mr. Tindal's Continuation of Mr.Rapin's History of England'. Paris, c.1692. 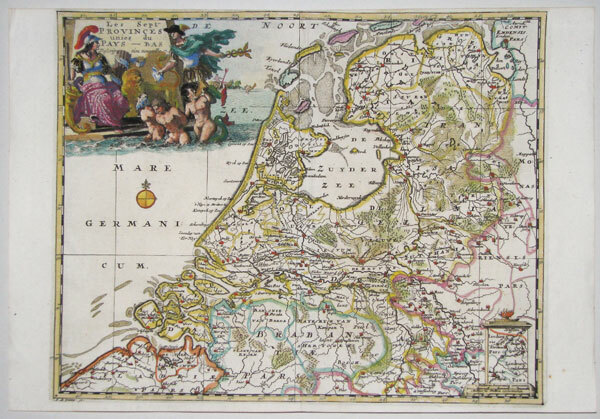 The Netherlands, engraved by A. de Winter for the quarto edition of Sanson's atlas. The title cartouche features allegorical figures including Mercury & Neptune. London, John Tallis & Co., c.1851. With inset vignettes including a view of Rotterdam. Antwerp, Jan Baptist Vrients, 1602, Spanish text edition. 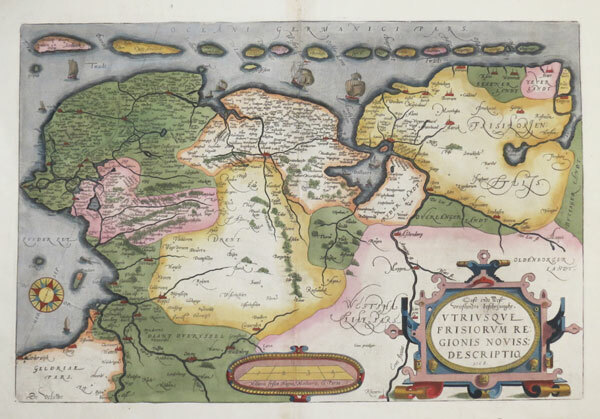 A map of West Friesia or Friesland, with an inset showing the region in Roman times, from a Spanish edition of the 'Theatrum Orbis Terrarum', the first edition published by Vrients. Antwerp, 1592, Latin text edition. 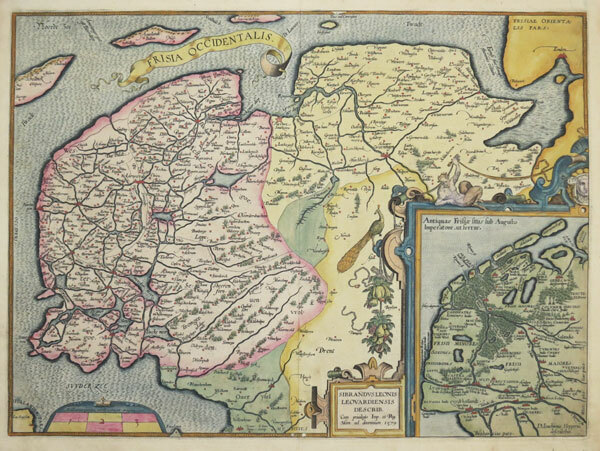 A map of Friesland, with an inset showing the region in Roman times, from a Spanish edition of the 'Theatrum Orbis Terrarum', the first edition published by Vrients. 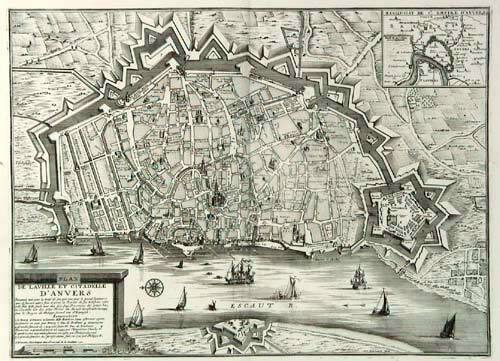 Amsterdam, 1640. West Frisland, with three fine cartouches in full colour. Paris: Crépy, 1767. 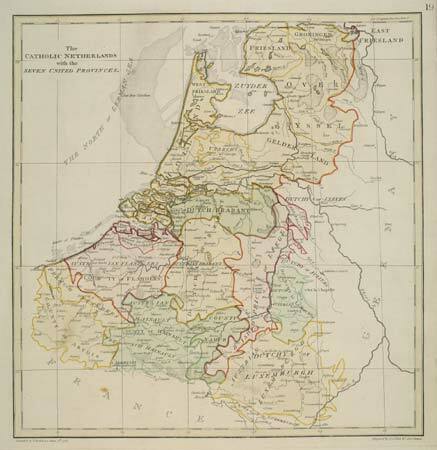 Province of the Netherlands. 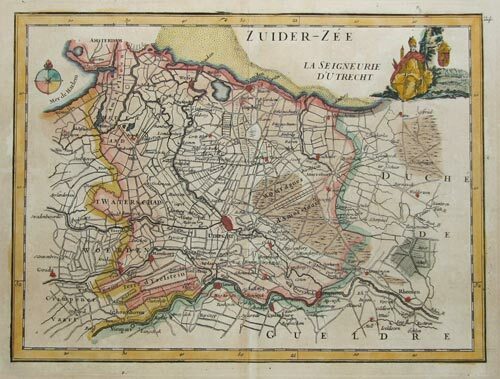 Leiden, van der Aa, 1711. An uncommon plan of Vlissingen, known in English as Flushing. In the 17th century Flushing was a main harbour for ships of the Dutch East India Company (VOC). 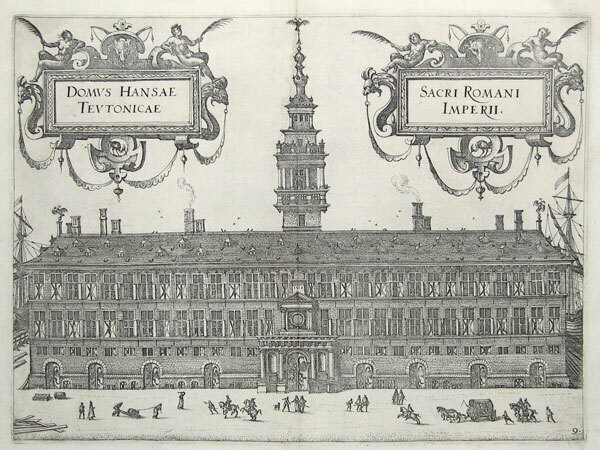 Amsterdam, Jansson & Henricus Hondius, 1638. 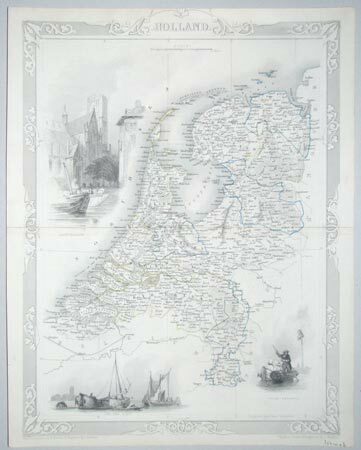 Decorative map of Zeeland, marking Rotterdam & Antwerp.